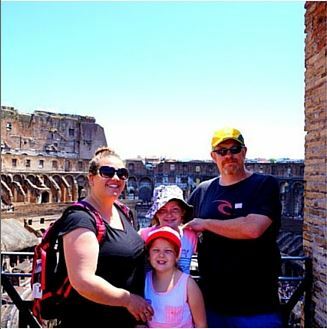 This Australian family travels the world with their children. On Instagram they caught my eye with their beautiful gallery full of travel images – and I am very happy that they are one of the traveling families willing to share their traveltips with us. Full-time travelers or part-time travelers: Part time travelers a few months a year, plus day trips and weekends in our area of Australia. Do you always take your kids along on your travels? Yes, always. They love traveling just as much as us. I could only imagine the looks of horror on their faces if we said we were heading off without them. Why do you travel with your kids? I think its important to show your children that where you live is not how the world is. We like to expose them to different histories and cultures which we hope will make them more understanding and accepting adults. Best tip(s) to travel with children: Come prepared and don’t under estimate your kids capabilities. We often book something or arrange something for a half a day every day and that leaves the other half open to do more or nothing depending on what the kids are like. Favourite destination for kids: Poland and Germany the people are so friendly to kids, actually Europe as whole is very child friendly. Place you wouldn’t take your kids to: I am up for most destinations but my wife would have reservations about certain places in Asia and the Middle East.